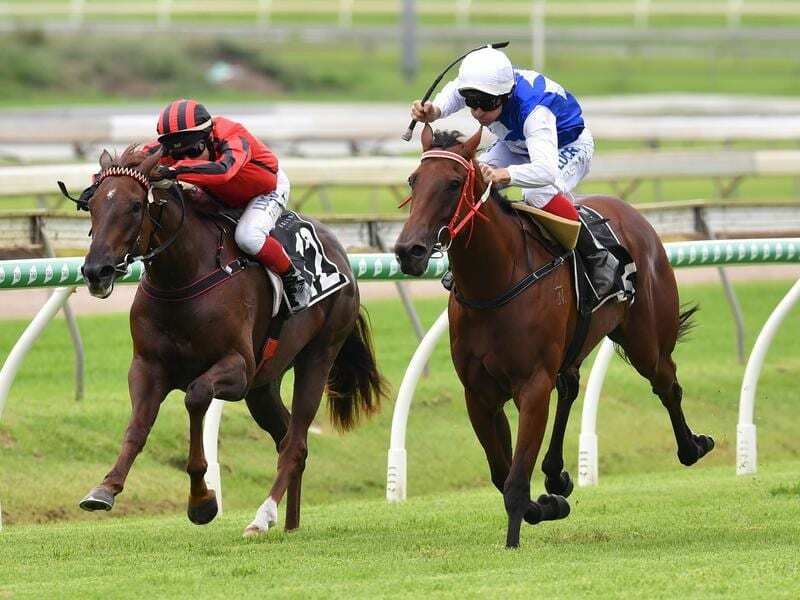 Miss Cavallo (right) confirmed her impressive rate of improvement with a Doomben win. Toowoomba trainer Michael Nolan has some big decisions to make if his filly Miss Cavallo continues to improve at her current rate. Miss Cavallo ($2.80) made it two wins from four starts when she charged home to win the Keylinks Community Services Handicap (1200m). Nolan admitted he wasn’t exactly sure what direction to take with Miss Cavallo who has now won nearly three times her purchase price as a yearling of $55,000. “Really I don’t know if she would be up to the better horses in the winter. But then again after she failed at her first start and we spelled her. She has come back a better filly,” Nolan said. Dale Smith, who rode Miss Cavallo, said he thought the filly would certainly get over further than 1200m. Miss Cavallo is by Nicconi out of the mare Soaring Angel and was bred by Nolan’s uncle Basil at Raheen Stud. “I always like winning races for Raheen and I think Miss Cavallo can give them a few more boosts,” he said. Michael Nolan is having a good season with his two-year-olds and will have one of the favourites for the Capricornia 2YO Classic in Rockhampton in a fortnight with Patches.